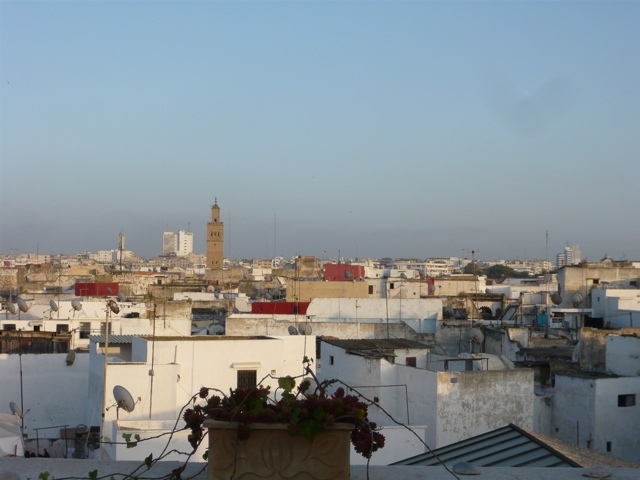 After my experience in the Rabat medina, I was utterly exhausted yet for some reason, I kept on going like the Energizer Bunny. I couldn’t stop. 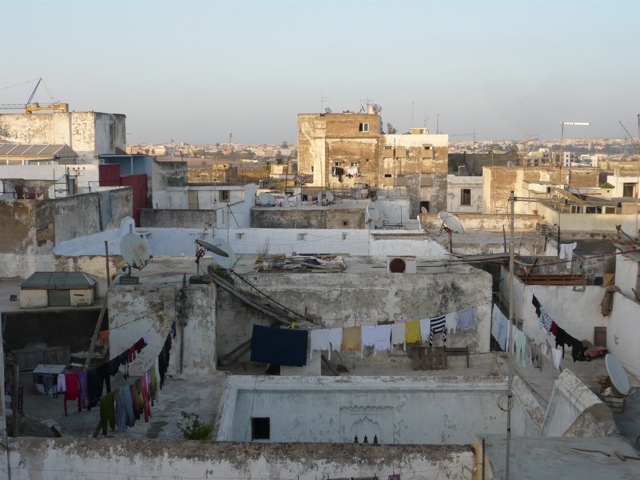 I was mesmerized by what I’d seen and the Casbah was only a short walk away. 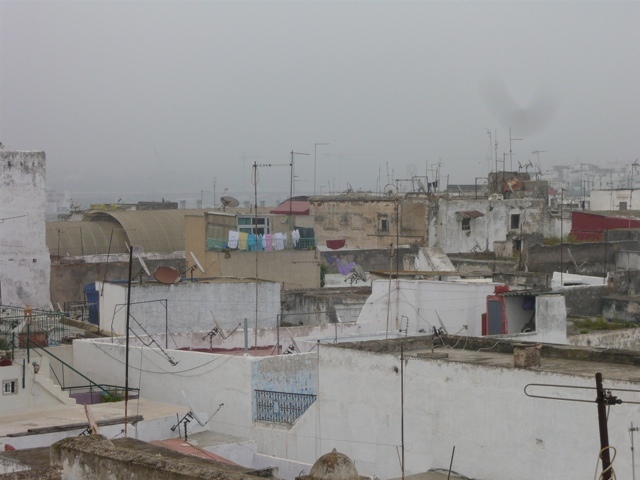 The sun was beginning to set and cast a beautiful rainbow of pinks, reds and oranges against the whitewashed buildings of Rabat, and the Casbah’s grand presence was overwhelmingly alluring. 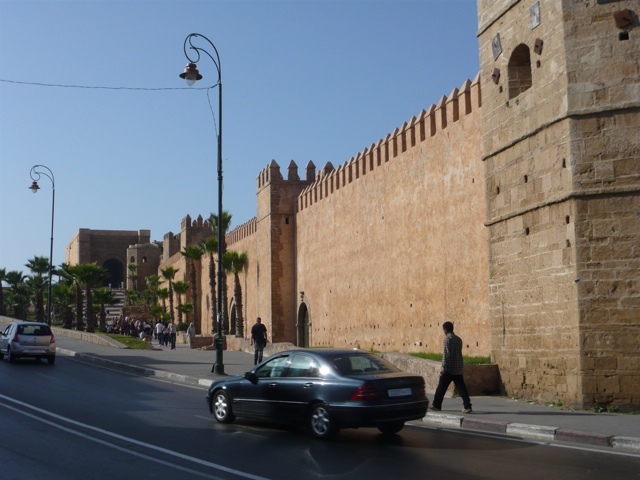 So, instead of going back and relaxing I crossed the busy street, jay-walking, following the well-versed Moroccans and headed over to see one of Rabat’s oldest parts of the city. The Casbah is a lovely, tranquil place to wander. 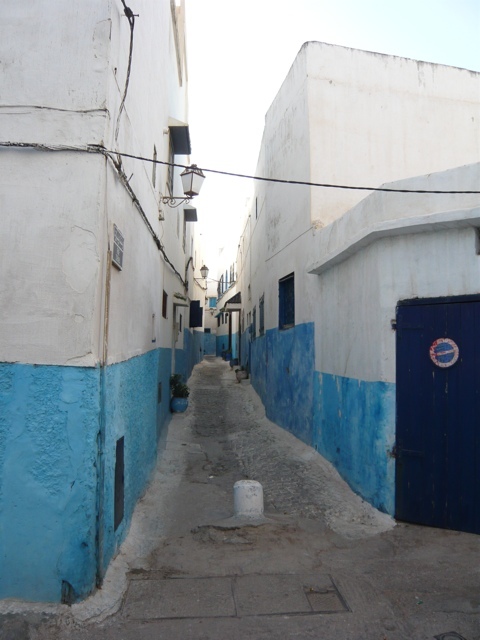 There are beautiful, hidden alleyways and whitewashed buildings with varying hues of blues. It is mostly residential now and apparently many rich foreigners are buying up the picturesque homes. 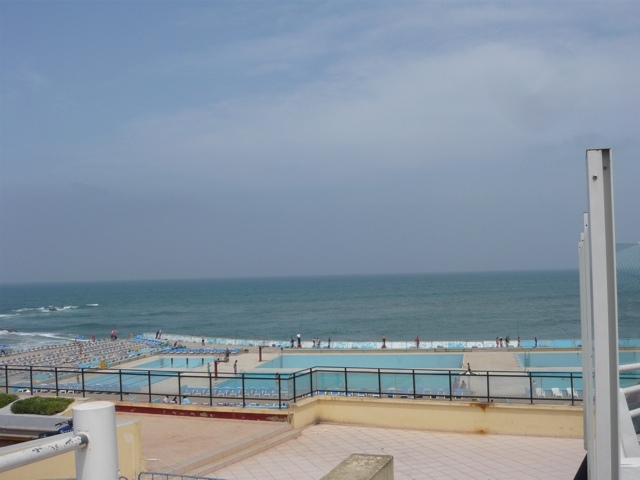 At the end, you enter and enormous open space which affords a spectacular view of the river and the sea. It is gorgeous and I could have spent an hour there just relaxing if it wasn’t for the hordes of teenage Moroccan men who were obviously on the prowl. I couldn’t help laughing that a young man who could practically be my child was harassing me in french and giving me looks! If only they knew I was almost 40! I returned to the hotel at seven o’clock, extremely tired yet knew that I had to stay up. That is the number one rule of jet lag. You must remain awake all day long and if you sleep during the day, you are finished! 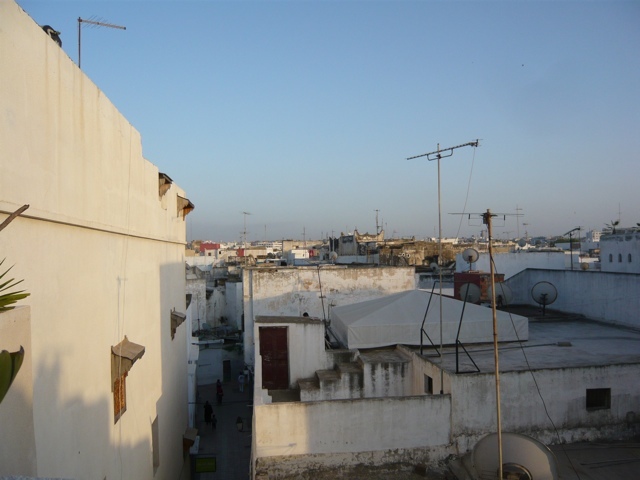 So, despite the fatigue, I grabbed my glass of wine that I saved from my Air France flight to Rabat and headed upstairs to the Riad’s rooftop terrace. The view was spectacular and there was little noise except a couple of nearby chickens. I savored my wine and then headed downstairs for a delicious Moroccan meal of Chicken tagine with a seventy-year-old couple from Boston who were traveling with their thirteen-year-old grandson. It was their grandson’s first trip out of the US and he was in for quite an adventure (which included a trip to the Sahara desert for a camel ride, a hike in the Atlas Mountains and visit to Berber villages and a journey to magnificent Fez). Wow! The dinner was delightful and I enjoyed my first glass of Moroccan Red Wine. It was so ironic to be drinking wine in a Muslim country yet I was soon to discover that Morocco is much more modern than any other Islamic country in the world. 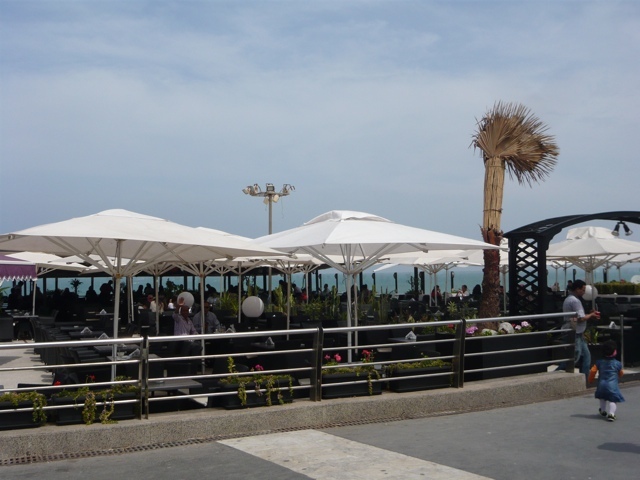 The Muslims of course are forbidden to drink alcohol yet it is widely available for tourists and the large sum of ex-pats that live in Rabat and Casablanca. It was lights out by 9:30 PM. I was proud of myself for making it so long! What a wild and crazy day! 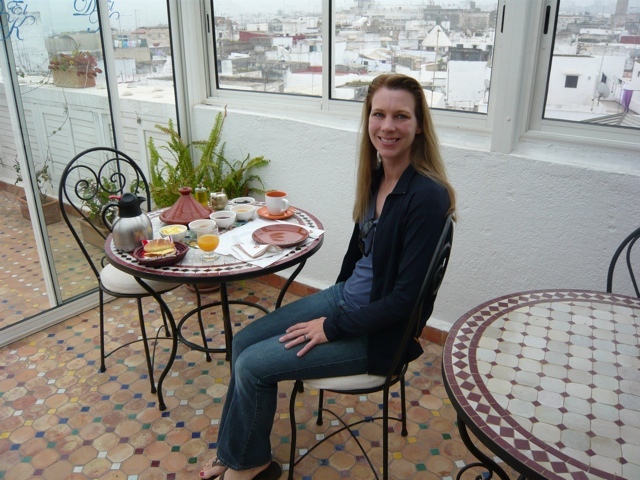 The United States, an eight hour flight, a visit to Paris for a cup of cafe creme, a flight to Rabat, a visit in search of body lotion to a souq and my first Moroccan meal! I’m tired just remembering all the things I did in a twenty-four hour period….nuts! I slept hard for four hours, then was up for two (when I decided to write on my blog) then back asleep again until 7:30am. Not bad for my first night in Morocco! Breakfast was served on the terrace. 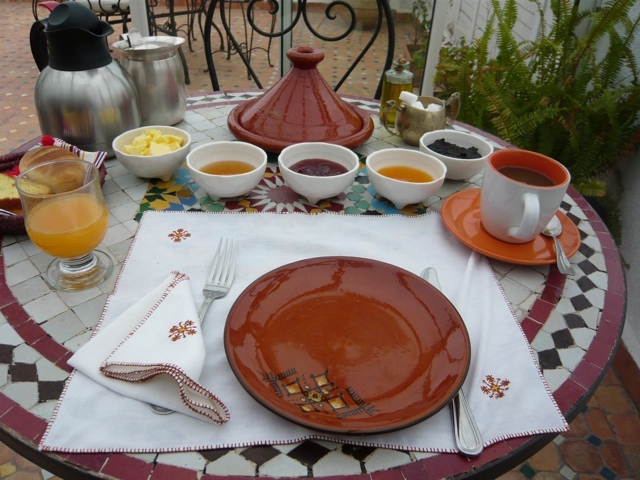 I was served a traditional Moroccan meal that included Moroccan crepes, mint bread, coffee and four wonderful, homemade condiments to put on the crepes. I was really looking forward to the day ahead. 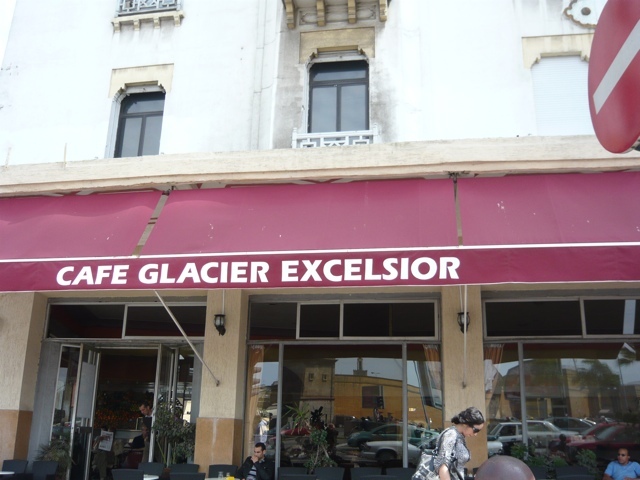 I had hired a driver, Mohammed (same driver that picked me up at the airport) to take me to Casablanca (aka “Casa”) where I would meet a french-speaking guide and receive a city tour. Thank goodness I speak French because French is the second language of Morocco thus most Moroccans speak Arabic and French. English is rare. 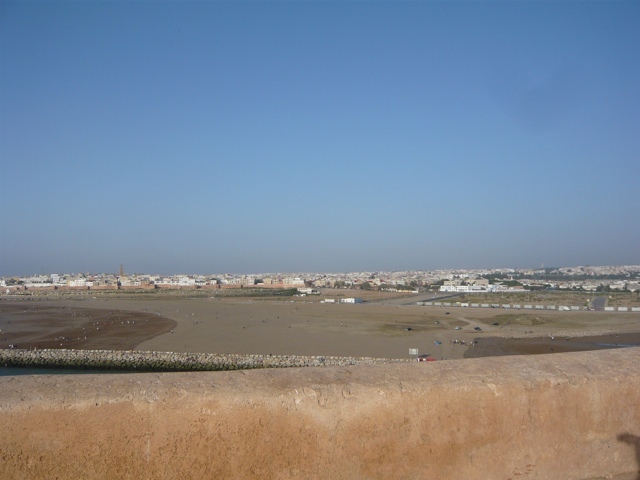 The drive to Casa is about an hour south of Rabat, following the Atlantic Ocean. There is not much along the way except farms and countryside. Mohammed was very proud to inform me about the government’s great improvement plans to the infrastructure. 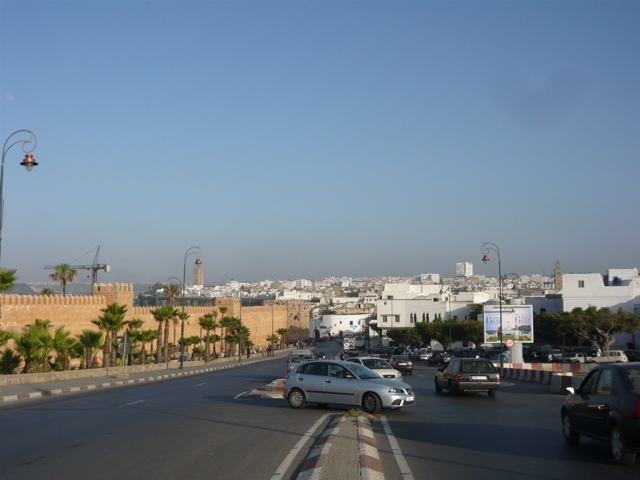 A third lane is currently being added to the autoroute linking Rabat to Morocco. 1. The name Mohammed is the most popular male name in Morocco and is given to the oldest son. Means “The Prophet”. 2. Fatima: Is the most popular female name. It means “Daughter of Mohammed”. 3. The government in Morocco does not give unemployment benefits. So if you don’t work, you are out of luck. 4. Average cost of petrol: 11 Dirhams/1 Euro per litre of gas. 5. In Morocco, now about 50% of women work. The generation before was only 1-2%. 6. Population of Casa city center is 5 million. 7. Rick’s Cafe is a HOAX! Movie Casablanca was fllmed completely in Hollywood studio. Producer had never been to Casa. There is a fabricated Rick’s Cafe in Casa. Tourist deal. 8. 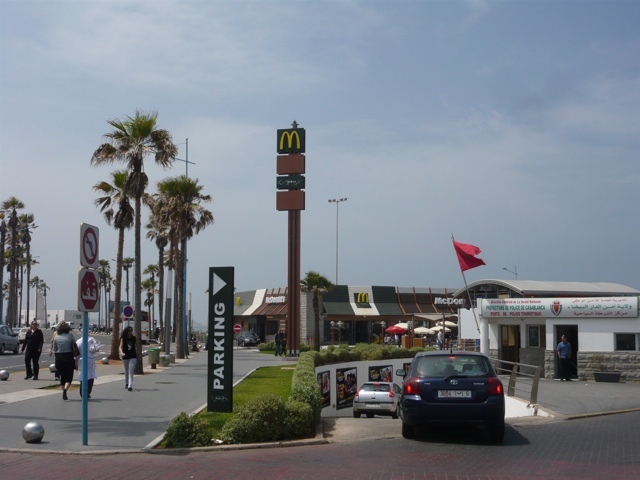 Casa hosts the first McDonalds in all of Africa. It opened on December 18th, 1994 (funny fact here: that is my guides birthday AND my husbands birthday…December 18th!). Coming up in my next post….. My next stop was to the only mosque in Morocco that allows visitors inside. That first day of travel is always so brutal. And there’s always a McDonald’s no matter where you go. Great post.